Bruce Springsteen is the Broadway star of the moment. His new show is sold out, with tickets on resale websites available at prices approaching $10,000 a seat. It is replacing "Hamilton" as the Broadway show that most resonates in the contemporary context. The Springsteen show arrived on Broadway, at least figuratively, from Washington. D.C., or, more precisely, from 1600 Pennsylvania Avenue. In November 2016 President Obama awarded Springsteen the Medal of Freedom. Springsteen returned the favor by playing a 15-song farewell concert in January 2017 for Obama and his staff. The set list as published included many classics. Conspicuously absent, though, was one of the Boss's greatest songs, "Wrecking Ball." If it had been included, it would have been hauntingly apt, considering what was on the way. Springsteen first performed that song publicly in 2009 at Giants Stadium in New Jersey, which was to be demolished. It is not only about wrecking, but about what is to be built. The song wouldn't have applied to Obama. But it may be the one tune that best explains President Trump. Trump, with his judicial nominees and his regulatory, and legislative agenda, with his tweets aimed like darts at the arrogant coastal elites, is determined to undo a lot of the centralization of power in Washington that has accumulated over decades. He is the wrecking ball. That may help explain why so many senators and members of the Washington and New York-based press corps so ardently dislike, even fear Trump. Those politicians and journalists have succeeded under the set-up that Trump wants to knock down. Trump has showed up with a wrecking ball at their Washington front door. Trump's base understands that, which may be why the attacks from the press and the senators haven't shaken their support for Trump. Springsteen and his song are of a place — New Jersey — where Trump has strong ties. The CBS News White House correspondent Mark Knoller recently said Trump has spent 42 days of his presidency at his golf club in Bedminster, N.J. Even the reference to "steel" brings to mind Trump's commerce secretary Wilbur Ross, who was a champion of that industry as an investor. Springsteen himself — a white, male college dropout — represents the face of a lot of Trump voters. He and Trump are about the same age — Springsteen is 68, Trump is 71. 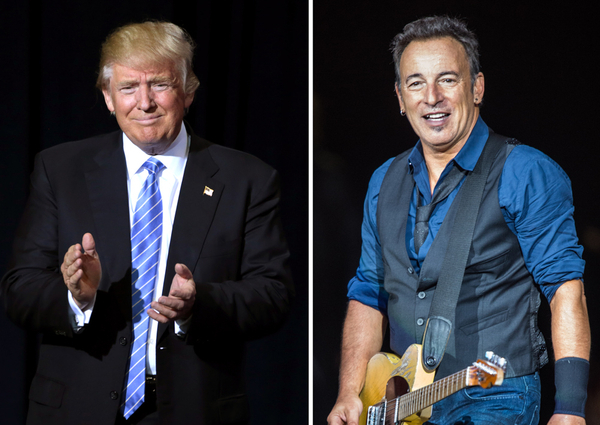 Both have been very successful: Trump in business and politics, Springsteen as a performer. Springsteen and American presidential politics have a long and complicated history. A 2014 Politico piece traces it to the conservative columnist George Will attending a Springsteen concert back in 1984, and President Reagan then making a campaign appearance in New Jersey and offering a tribute to the performer's "message of hope." Triumphant, patriotic, populist themes in Springsteen's lyrics have made him intermittently resonant with other Republican politicians. Newsweek once ran a timeline tracing New Jersey Governor Chris Christie's 40-year "relationship" with the Boss. Jeffrey Goldberg's 2012 Atlantic article, "Jersey Boys," reported, "I have met very few people who love Springsteen the way Christie loves Springsteen. This concert is the 129th the governor has attended. His four children all went to Springsteen shows in utero. He knows every word to every Springsteen song." Leave it to Reagan, the great optimist, to find in Springsteen's songs a message of hope. It's easily missed, but it's unmistakably there, even in a song like "Wrecking Ball," written years after Reagan's death: "Don't fall to your fears." The "wrecking ball" did knock down the old Giants Stadium, but that venue was replaced at the Meadowlands by MetLife Stadium. The new stadium has a larger capacity, includes more luxury boxes and club seats, and is more environmentally friendly. The change ended up better for the fans and for the team owners. The new stadium is more comfortable and more profitable than the old one. Any builder, like Trump, knows that before putting up a hotel or a casino or a luxury apartment building, you have to first prepare the site. Sometimes that requires a wrecking ball. It's not a wrecking ball of mere destruction. It's a wrecking ball that's a prerequisite for creativity and growth, for dynamic improvement. Some of the president's demolition work may topple the monuments of Obama-era Washington, D.C — the Iran nuclear deal, ObamaCare, an overly complex tax code, the Dodd-Frank financial regulations, Deferred Action for Childhood Arrivals, the Paris climate agreement. Some of it may reach back to administrations before Obama. Either way, Trump is standing in defiant opposition, seeking to dismantle the aggrandizement of "we know better" authority in Washington and to disprove the idea that American history is a steady advance of progressivism. Springsteen, personally, has expressed some wariness; he endorsed Hillary Clinton in the 2016 election. After the Trump inauguration, he fetched up on foreign soil to pronounce himself "embarrassed." If the singer himself doesn't get it, though, his "Wrecking Ball" lyrics sure do capture it. It's not a sad song. The hope it conveys is why so many people who voted for Trump are greeting his presidency by cheering it on. In essence, they are singing along with Springsteen: "Bring on your wrecking ball."